In this course, Professors Kristie A. Boering, Marcin M. Majda and and Angelica M. Stacy give 42 video lectures on General Chemistry. Stoichiometry of chemical reactions, quantum mechanical description of atoms, the elements and periodic table, chemical bonding, real and ideal gases, thermochemistry, introduction to thermodynamics and equilibrium, acid-base and solubility equilibria, introduction to oxidation-reduction reactions. 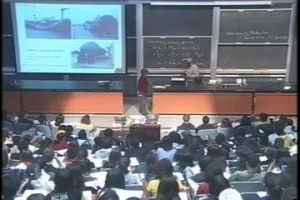 Prof. Kristie A. Boering in Lecture 6: Attractive Molecules: Liquids and Solutions.